Welding wire is mission-critical for your work. You need a supplier who has the right product available when you need it. At some point, you will probably need some advice on which filler material to choose for an unusual situation, too. What happens when you call your current supplier for advice? What is the response when you ask a question that is not included in the salesman’s script? When you call Josef Gas, you will speak to a representative who has practical welding experience, and if your situation is too complex for that rep, he will connect you to one of our specialists who have formal training in welding technology and understand welding equipment, in addition to their experience in the trade. Josef Gas is locally owned and operated by father and son team Joe and Richard Stangl who, together, have more than 70 years’ experience in the fields of welding and industrial gas. We understand what it takes to get the job done right, and we know that our customers need more than just materials from us: We are the added value. Fibremetal, Jackson, J Walter, SAIT, Bernard, Tregaskiss, Bonarc, AGO, American torch Tip, Pferd Abrasives, Avesta, and Bohler. We offer our customers one-stop, full-service welding supply. 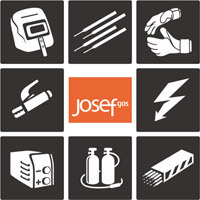 Anything your work requires, from welders and parts to gas, to welding wire and stick electrodes for any application, you will find it at Josef Gas, at competitive prices, with superior service. We operate our own fleet of delivery trucks throughout the Greater Toronto Area, so if you cannot get to our showroom in Concord, we will deliver your supplies to your shop. Because we are a mid-sized operation, we have the flexibility to be more responsive to our customers’ needs than a huge, corporate supplier can offer. If you run out of the wire you are working with, or find you need different filler material than you have got on hand, we are there for you. Do you have a rush job for a customer? We have got you covered, because we answer to our customers, not to corporate bean counters. Work with a supplier who understands what it takes to get your job done right. Experience the difference of working with a locally owned company who treats you like an individual, not an account number. We invite you to request a free quote online, or give us a call at 416-658-1212 to speak to one of our representatives for more information or help with a quote.